Conversion optimization isn’t just for landing pages or paid search ads. Every action you ask customers to take should be looked at through a conversion-centric (which ultimately means “customer first”) lens. 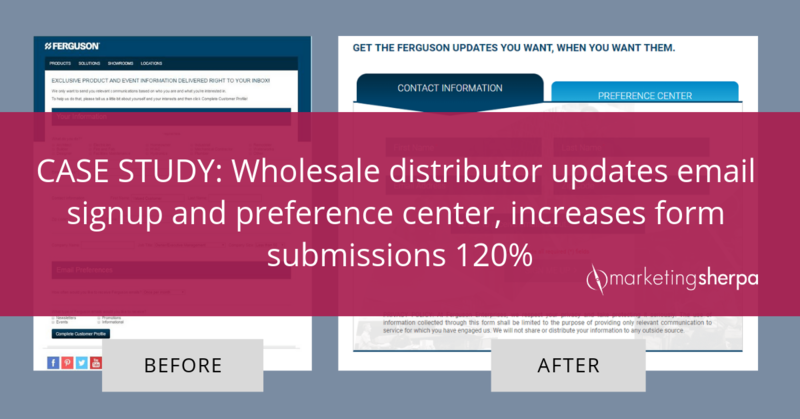 Read on to discover how a conversion-focused preference center overhaul increased customer engagement for Ferguson Enterprises. “We realized the importance of giving customers the reins to their own email experience — to retain them as active and engaged subscribers. Therefore, having a good functioning preference center was a must,” Ferguson email marketing strategist Villy Lammie said. 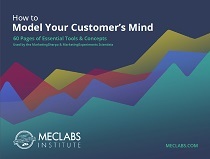 This case study was originally published in the MarketingSherpa email newsletter. The “lead-free 1-1/4 in. Brass Full Port PEX 200# Ball Valve” means nothing to you or me but to a plumber, it is an essential part necessary for them to do their job and earn their livelihood. As the largest wholesale distributor of residential and commercial plumbing supplies (and pipe, valves and fittings) in the U.S., Ferguson Enterprises serves its customers — B2B customers like plumbing professionals and contractors, as well as B2C customers like homeowners — with the right parts and expert assistance to get the job done. The $16.7 billion company sells through an ecommerce store, but it also has 1,400 physical brick-and-mortar locations. Ferguson helps these professionals (along with novices like homeowners) in person, thanks to the experts at its physical locations, but it also helps them through its email marketing. So like most companies, it isn’t enough for the company to get names and email addresses stowed away in a database. Segmentation is critical. After all, what is important to the plumbing professional can be very different from what an HVAC technician, architect, interior designer or homeowner needs. 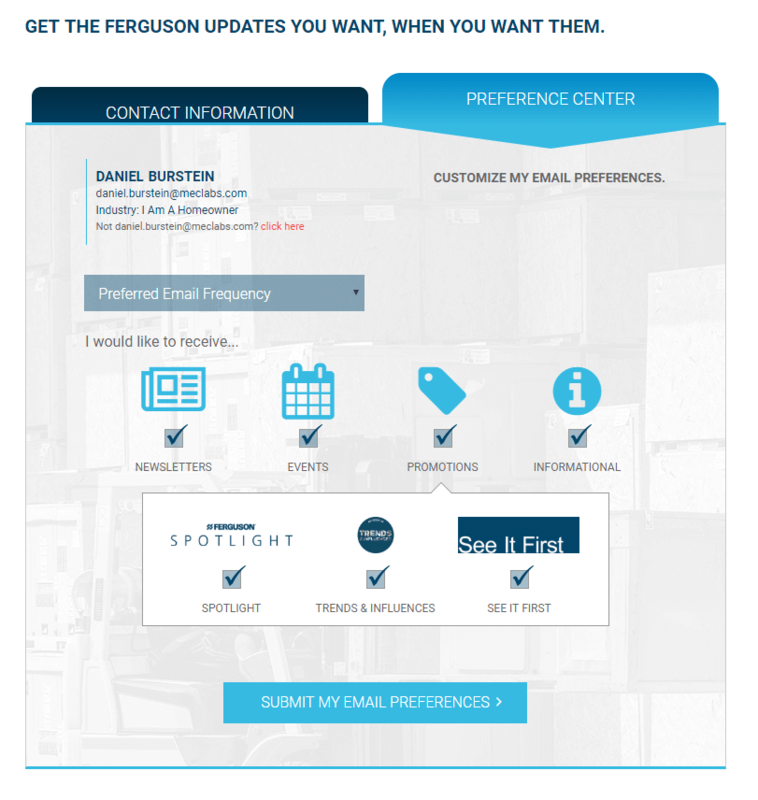 Villy Lammie, email marketing strategist in the Marketing Department of Ferguson Enterprises, led an overhaul of the company’s email signup and preference center to better serve Ferguson’s 12 customer segments. “There are many articles out there that advocate for segmenting your audience and developing an email preference center, but when it comes to specific instructions on how to create one, the information is slim to none,” Lammie lamented. Marketing is an idea-driven profession. Before you can make changes to your email marketing, marketing automation or other technology, you need the right idea. You might find the inspiration for that idea from a traditional business source like your dog-eared marketing textbook. It might be a creative source like a trip to a museum. Or maybe it’s online content like the case study you’re reading now. Conversion rate optimization (for companies that do it) can get shunted off to the side. Perhaps it’s just used for a specific PPC campaign or a landing page test. But let’s face it. Conversion-centric marketing is just marketing. The goal of all marketing should be to get an action (or at least a new mindset) from a customer. Actions like simply engaging with a preference center are important as well. Here’s a look at Ferguson’s original forms. 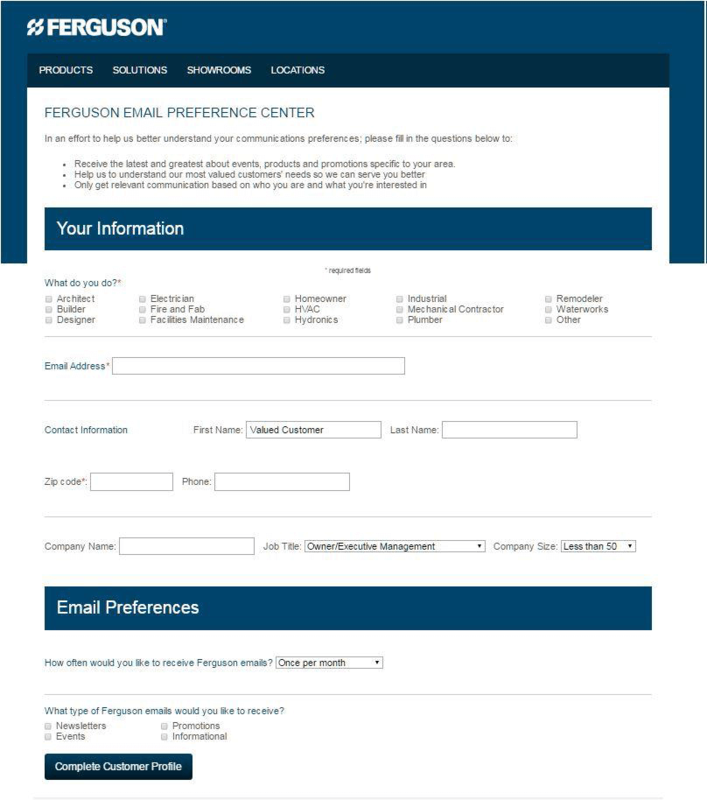 ► Splitting the preference center into two steps with two distinct (but conjoined) forms (no repeat questions, each form serves a purpose) – The signup contains only the bare minimum required questions to acquire a subscriber, while the Preference Center expands with additional “nice-to-know” information that has an appealing look and feel, and questions based on the industry selected in the previous step. This allowed the team to decrease the length and size of the forms and split the questions into multiple steps to reduce friction that could keep customers from converting. 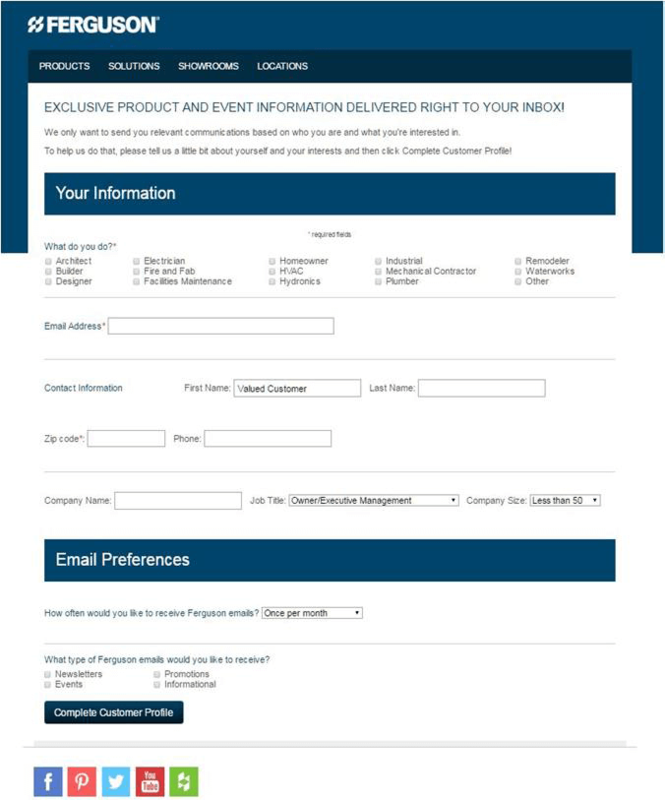 The forms, though distinct, are connected with a tabbed design so a customer can switch back and forth as needed to update information. ► Removing default selection for demographic data – “This was a big lesson because with the original forms more than 50% of our customers had the default selection recorded. Customers did not update it and just submitted as is,” Lammie said. 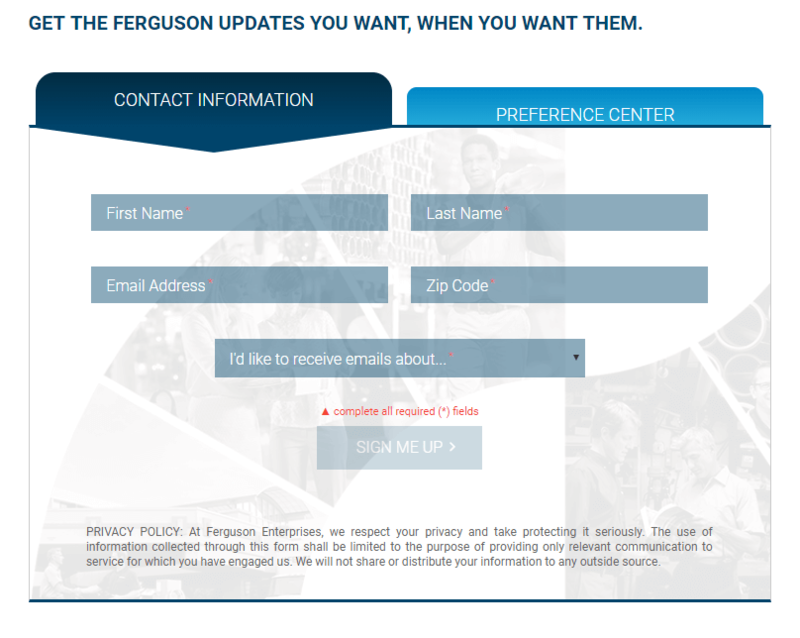 For example, in the original forms under “Email Preferences” there was the question, “How often would you like to receive Ferguson emails?” The drop-down defaulted to “Once per month,” so the team couldn’t be sure if customers actually wanted that frequency or just never bothered to change the drop-down. ► Adding a privacy notice – "Another lesson from Flint on reducing anxiety and increasing conversion,” Lammie said. The background image of the preference center is personalized based on the customer’s industry, and the final pop-up page is as well. 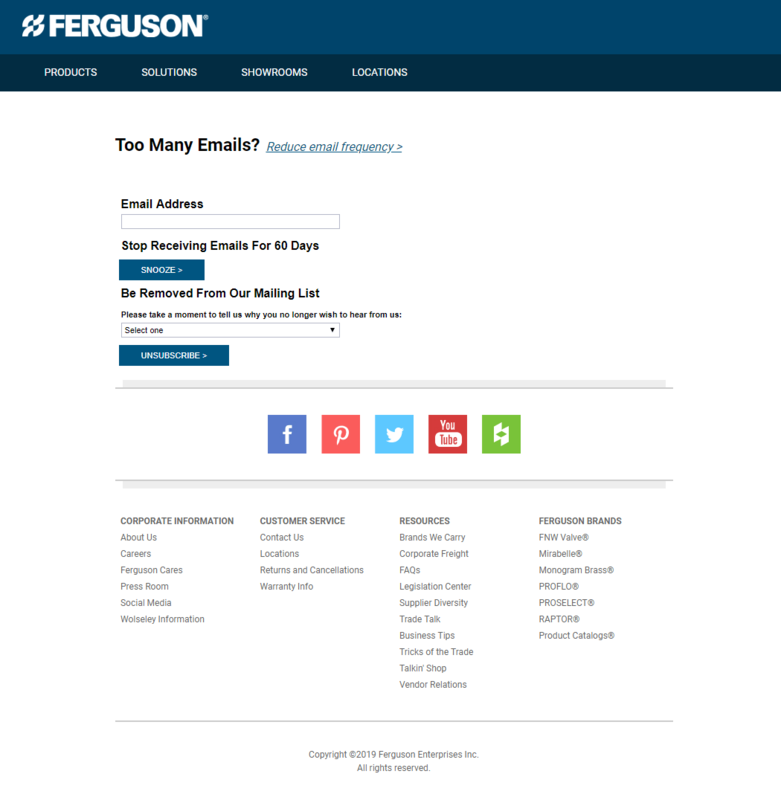 The company has two flagship websites: Ferguson.com and FergusonShowrooms.com. The browse button link is dynamic, based on which website serves the email subscriber’s industry. Additionally, if they are in an industry for which Ferguson supports an online trade account registration, they will see a second button with the “Become a PRO” CTA. Also, the header and footer for the forms are dynamic, based on which site they are accessing the form from by mimicking that site’s header and footer. “The biggest improvement has been the jump from two essentially similar pages to two distinct but connected forms that provide a customized experience for each different industry and collect a large amount of data without being overwhelming. Therefore, we are able to increase segmentation and further personalize emails, as we can now target customers’ interests beyond just customer type,” Lammie said. For example, a waterworks customer can now specify if they are a utilities contractor, municipality or plant contractor, since they can now see these options once they have identified their industry. Additionally, customers can now choose specific promotions. “Let’s say you are a plumber that has selected to receive promotional emails. Now you can cherry-pick which specific recurring promotions you would like to receive: Hot Deals, Tool Flyer, etc.,” Lammie said. In addition to updating the email signup and preference center, the team updated the email opt-out page. They provided more options before unsubscribing, like a link to the preference center to reduce the number of emails (“Reduce email frequency”) or snoozing for a certain amount of time (60 days). The customer now is able to customize their own email experience: how many emails they want to receive, what type of emails they want to receive, etc. “The project was a great success, as not only did it increase submissions, but it also solved for multiple business needs that were not accommodated before, and still managed to provide a cohesive customer experience,” Lammie said. The team realized a 120% year-over-year increase in form submissions for the signup and preference center and a 117% increase in site visits from the preference center. “My personal satisfaction came afterward, as the form redesign became an example of the email team’s expertise, and it created a benchmark for future endeavors. Having an increase in submissions was an obvious win, but creating standardized data, optimizing the point of entry and getting more customer-provided data are results that benefit all other campaigns,” Lammie concluded. Whereoware (third-party email support vendor) – “They were instrumental in the implementation of the project,” Lammie said.